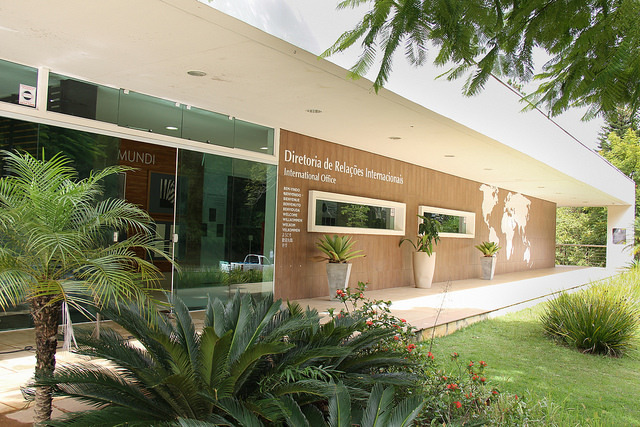 The International Office is part of the University’s Central Administration and supports and coordinates the UFJF international activities. We build and manage international collaborations and agreements, develop and promote international programs, provide information and logistical support for international students and scholars, help UFJF students/faculty/staff expand international opportunities that enrich research and learning, coordinate inward visits by overseas delegations, and work to increase the visibility of UFJF’s international activities around the globe. Bárbara Daibert holds a Comparative Literature Ph.D degree awarded by UFF and a Literature Theory master’s degree awarded by UFJF. Graduated in the following majors: English language and literatures; Portuguese language and literatures; Latin language and literatures. English language literatures professor at the Modern Foreign Languages Department and Comparative Literature and Cultural Studies professor at the Literary Studies postgraduation program at UFJF. 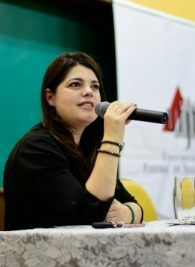 She has also been a researcher at the National Library of Brazil with the research project entitled “Entre o romance e o periódico: memórias traumáticas em Maria Firmina dos Reis”. The International Agreements sector is responsible for the opening, processing, monitoring and renewal of cooperation agreements held between UFJF and the foreign partner institutions. The Incoming Exchange sector is in charge of the collection, documentation, reception, registration and monitoring of foreign students who come to UFJF either through the international agreements held between UFJF and various foreign universities or through international programs such as Coimbra and Erasmus. The Outgoing Exchange sector is in charge of the entire process of sending UFJF students overseas, being responsible for elaborating, publishing, selecting, executing and monitoring the International Exchange Program for Undergraduate Students (PII-GRAD) and the International Exchange Program for Colégio de Aplicação João XXIII (PII-JOÃO). The Exchange Program for Undergraduate Students (PEC-G) is a targeted initiative for students from developing countries with some sort of educational, cultural or scientific-technological agreement with Brazil. Developed by the Ministry of Foreign Affairs (MRE) and by the Ministry of Education (MEC), in partnership with public and private universities, the PEC-G selects foreigners between the ages of 18 and preferably up to 23 years to complete the graduation in Brazil. Ruled by Presidential Decree n.7.948, the PEC-G has a specific calendar of selective processes that starts in February and ends in December. To meet the selection criteria of the program, the student must prove that he/she is able to pay for his/her expenses in Brazil, have a certificate of completion of high school and proficiency in Portuguese. In addition, the interested party must undertake the commitment to return to his/her country and contribute to the area in which he/she graduated. In the present moment, the program has 59 participating countries (25 from Africa, 25 from the Americas and 9 from Asia), with Africa being the main source of most of the students. In the present moment, our university offers courses in all units, with 104 vacancies in 38 daytime courses. The Events Management and Public Relations sector is in charge of the organization of academic, administrative and welcome events promoted by the International Relations Office. It also performs the role of press office.